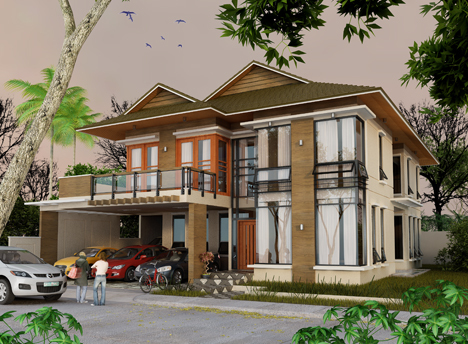 The style and design of this House and Lot instills luxury and a certain charm where even the elite of the society will surely admire. This will surely shine in family parties and gatherings and will make the visitor go wow with its finishes and architecture. The rooms are carefully planned and the look is definitely captivating. No Flood, and comes with a 4 car garage! Lot Area = 358.00 sq.m. Livable Floor Area = 335.00 sq.m. Garage, Lanai, Porch & Balcony = 105.59 sq.m. Total Floor area = 440.59 sq.m. G. Master Bedroom with walk-in-closet and toilet & bath. H. Bedroom 1, 2 & 3 with closet, toilet & bath. Roofing – Daedong Stone Coated Steel Roof Tiles, made in Korea. Foundations, Columns, Beams, Slab on fill, 2nd floor Slab. Walls – concrete hollow block plastered on both sides. Ceilings / Soffits – 13mm thk Gypsum board on furring channels for areas not exposed to weather. utility, all toilet & baths, pvc spandrel for eaves ceilings on furring channels. Foyer, Living, Dining, Kitchen – 24” x 24” Granite tiles. All Bedrooms & Guest Room – HDF Laminated floors from Germany. Garage, Porch, Lanai, Balcony, Utility – 24” x 24” non-skid mariwasa floor tiles or equivalent. Second Floor Toilet & Bath – italian tile 24” x 24” wall tile & 24” x 24” for floor tiles or approved equal. Hot & Cold H20 line using Wexan pipes & fittings, 100% non-corrosive.